Description: This is a genomically integrated construct in which the GFP protein was placed under control of the yeast CUP1 promoter. Description: This construct was designed to be regulated by yeast CUP1 promoter. Downstream to this is a Bbox mRNA sequence followed by a fusion protein consisting of MS2 coat binding protein and CFP. Main use: to be one half of the AyeSwitch. The Bbox mRNA sequence can be bound by N-peptide, (from GAL1p-Npep-GFP) which inhibits translation of MS2 coat binding protein and CFP. Translation of the MS2 coat binding protein allows inhibition of translation of Npep-GFP whilst CFP provides a means of quantification. Description: This construct was designed to be regulated by yeast GAL1 promoter. Downstream of this is a MS2 mRNA sequence followed by a fusion protein consisting of two N-peptide binding proteins and GFP. From the figure immediately below, it can be seen that there the Gal1p-[Npep-GFP] and Cup1p-[MS2-CFP] constructs are mutually inhibiting at the translational level. 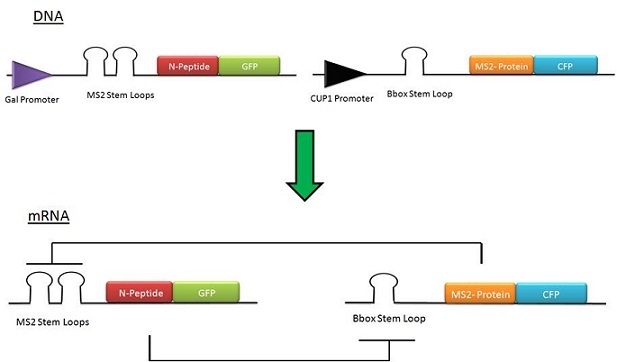 This is because the Npeptide, as part of an Npep-GFP fusion protein, is able to specifically bind the B-box mRNA stem loop in the Cup1p-[MS2-CFP] mRNA, and conversely, the MS2 protein, as part of an MS2-CFP fusion protein, is able to specifically bind the MS2 mRNA stem loops in the Gal1p-[Npep-GFP] mRNA. Each construct can be controlled transcriptionally using, respectively, galactose or copper ions in the growth medium. Description: This was a construct already avalilable in the host laboratory, in which the MS2 RNA-binding protein was placed under the control of an inducible MET17 promoter. This promoter is induced in the absence of methionine in the growth medium, and repressed by its presence. Description: This construct consisted of a constitutively active TEF1 promoter controlling the expression of a CFP sequence downstream.